Sears Will Close 72 More Stores, After Quarterly Sales Drop Nearly 12 Percent : The Two-Way Sears Holdings Corp., which controls both Sears and Kmart, says it has "identified approximately 100 non-profitable stores." Sears Holdings Corp., which operates Sears and Kmart, said Thursday that it is closing 72 more of its stores. Here, shoppers look for deals at the last remaining Sears store in Chicago before it closes this summer. 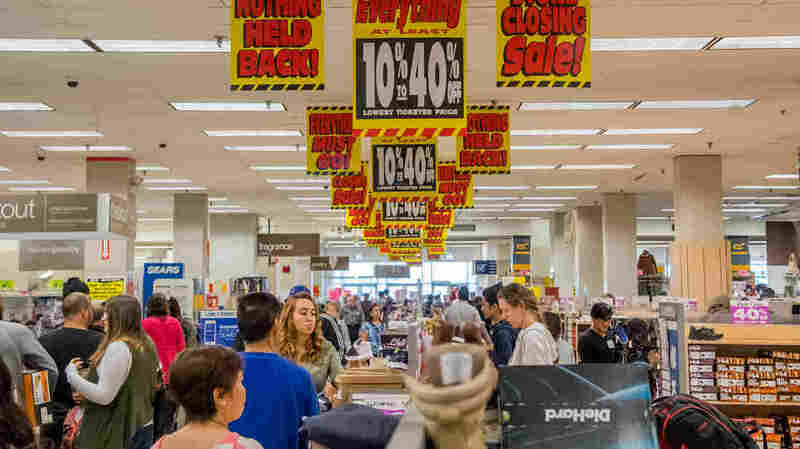 Sears Holdings Corp., which controls Sears and Kmart, says it has "identified approximately 100 non-profitable stores, 72 of which will begin store closing sales in the near future," in the latest sign of the retailer's struggles to stay afloat. The figure represents about 8 percent of Sears' remaining stores. Sears Holdings announced the closures in its quarterly results released on Thursday, in which it reported total revenues of approximately $2.9 billion — down from $4.2 billion in the same quarter a year ago. Sears has released a list of the affected stores. The company says its overall store sales fell 11.9 percent for the quarter — including a 13.4 percent decline at Sears stores. In the spring of 2017, Sears Holdings had 1,275 stores. At the time, the company acknowledged that "substantial doubt exists related to the Company's ability to continue as a going concern," in a federal filing that cited concerns over its profitability and debt. The chairman and CEO of Sears Holdings is hedge fund manager Eddie Lampert, who is also both the company's biggest investor and a major lender. After an initial attempt to turn around the company, Lampert increasingly seems to be in "hedge fund" mode: As MarketWatch reports, he recently wrote a letter to Sears — "effectively Lampert writing to himself" — to suggest the company sell its Kenmore appliance brand to his investment fund. Lampert also owns part of Seritage Growth Properties, a real estate investment trust that purchased more than 200 Sears and Kmart stores from Sears Holdings in 2015 and then leased them back to Sears. That batch of stores includes the last Sears location in Chicago — which is scheduled to close this summer. Sears has already sold its Craftsman brand, sending it to Stanley Black & Decker, which then cut a deal to bring the tool and equipment brand to Sears' competitor Lowe's. As online retail sales have boomed, Sears has announced a string of mass store closures — including back in 2011, when it said it would shutter more than 100 Kmart and Sears locations. In 2014, the former retail titan closed its flagship store in Chicago — where it once called Sears Tower home. That building is now called Willis Tower.